"West Side Story's" gifted playwright Arthur Laurents died at the age of 93, less than a month ago. He is probably hope looking down on the Bushnell's performance of the unforgettable musical this week. He would have been proud. First and foremost, it's a night of incredible dancing. Bernardo is still the leader of the Sharks. Riff is still the leader of the Jets. They don't like each other. How do they prove it? Ballet, jazz, salsa, and modern dance. Jerome Robbins' original choreography is preserved with great integrity in this production. It is an incredible sight to see the Bushnell stage filled corner to corner with exceptional dancers. The men steal the show from the women as the Jets and the Sharks dance through their pain and troubles. Secondly, it's a story of love and heartbreak. 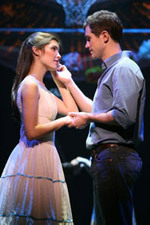 Tony (Kyle Harris) Maria (Ali Ewoldt) do this classic love story justice. Harris plays Tony perfectly as the adorable, romantic, honest hero with an unrelenting vibrato and a childlike charm. Ewoldt's flawless soprano vocals and talent for portraying Maria's endearing belief in love and life complete the love story. Harris and Ewoldt rejuvenate enduring classics like "Maria," "Somewhere," "Tonight," "I Feel Pretty" and "One Hand, One Heart." Thirdly, it's an evening of ensemble. Every character, every scene, every dance matters. Standouts include Drew Foster's comedic performance as Action, leading the Jets in "Officer Krupke," Michelle Aravena passionate Anita, and Stephen DeRosa comic genius as who transforms the often-unnoticed character of dance chaperone Glad Hand.